She was in the water when the epiphany struck. Of course, Annette von Jouanne was always in the water, swimming in lakes and pools as she was growing up around Seattle, and swimming distance freestyle competitively in high school and college meets. There’s even an exercise pool in her basement, where she and her husband (a former Olympic swimmer for Portugal) and their three kids have spent a great deal of time…swimming. But in December 1995 she was bodysurfing in Hawaii over the holidays. She’d just begun working as an assistant professor of electrical engineering at Oregon State University. She was 26 years old and eager to make a difference—to find or improve upon a useful source of energy, preferably one that wasn’t scarce or fleeting or unpredictable or dirty. The sun was going down. The wind was dying. She was bobbing in the swells. Today, von Jouanne is one of the driving forces in the fast-growing field of wave energy—as well as its leading proponent. She will explain to anyone who will listen that unlike wind and solar energy, wave energy is always available. Even when the ocean seems calm, swells are moving water up and down sufficiently to generate electricity. And an apparatus to generate kilowatts of power from a wave can be much smaller than what’s needed to harness kilowatts from wind or sunshine because water is dense and the energy it imparts is concentrated. All that energy is also, of course, destructive, and for decades the challenge has been to build a device that can withstand monster waves and gale-force winds, not to mention corrosive saltwater, seaweed, floating debris and curious marine mammals. And the device must also be efficient and require little maintenance. Still, the allure is irresistible. A machine that could harness an inexhaustible, nonpolluting source of energy and be deployed economically in sufficient numbers to generate significant amounts of electricity—that would be a feat for the ages. Engineers have built dozens of the machines, called wave energy converters, and tested some on a small scale. In the United States, waves could fuel about 6.5% of today’s electricity needs, says Roger Bedard of the Electric Power Research Institute, an energy think tank in Palo Alto, California. That’s the equivalent of the energy in 150 million barrels of oil—about the same amount of power that is produced by all U.S. hydroelectric dams combined—enough to power 23 million typical American homes. 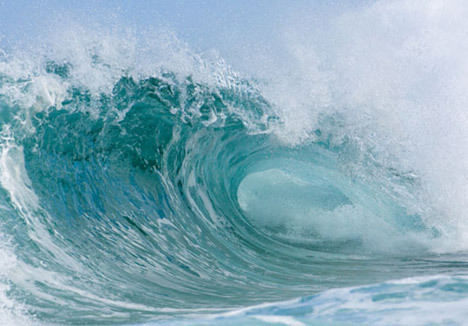 The most powerful waves occur on western coasts, because of strong west-to-east global winds, so Great Britain, Portugal and the West Coast of the United States are among the sites where wave energy is being developed. When her brothers, older by eight and ten years, came home for college breaks, she pored over their engineering textbooks. (An older sister pursued a business degree.) “Reading them confirmed that, yup, this is what I want to do,” she recalls. 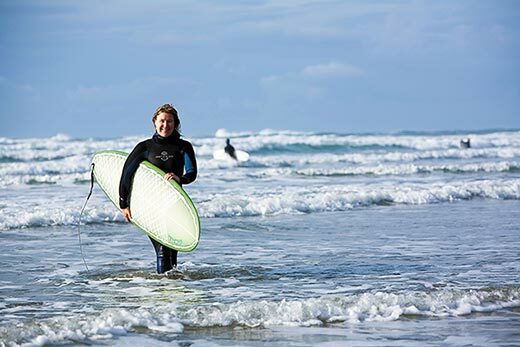 At Oregon State University, she related her wave-tossed epiphany to Alan Wallace, a professor of electrical engineering who shared her fascination with the ocean’s power. “We started saying, there’s got to be a way to harness this energy,” she recalls. They studied the wave energy converters then being produced and looked up centuries-old patents for contraptions to extract power from waves. Some resembled windmills, animal cages or ship propellers. A modern one looked like a huge whale. The gadgets all had one problem in common: they were too complicated. Take, for example, a device called the Pelamis Attenuator, which was recently deployed for four months off the coast of Portugal by Pelamis Wave Power. It looks like a 500-foot-long red snake. As waves travel its length, the machine bends up and down. The bending pumps hydraulic fluid through a motor, which generates electricity. Complex machines like this are riddled with valves, filters, tubes, hoses, couplings, bearings, switches, gauges, meters and sensors. The intermediate stages reduce efficiency, and if one component breaks, the whole device goes kaput. Von Jouanne’s lab is named in memory of Wallace, who died in 2006, but the Wallace Energy Systems & Renewables Facility (WESRF) is familiarly known as “We Surf.” Painted in deep blues and grays and bearing murals of curling waves, the lab has been a research facility and testing ground for such innovative products as an all-electric naval ship, a hovercraft and the Ford Escape Hybrid engine. In one corner is a tall buoy that resembles a huge copper-top battery. Beside it another buoy looks like two cross-country skis with wire strung between them. The designs were among von Jouanne’s earliest. “Breakthroughs are almost always born of failures,” she says. Her breakthrough was to conceive of a device that has just two main components. In the most recent prototypes, a thick coil of copper wire is inside the first component, which is anchored to the seafloor. The second component is a magnet attached to a float that moves up and down freely with the waves. As the magnet is heaved by the waves, its magnetic field moves along the stationary coil of copper wire. This motion induces a current in the wire—electricity. It’s that simple. By early 2005, von Jouanne had engineered one of her prototypes and wanted to test whether it was waterproof. She hauled the wave energy converter to her basement, into a flume that circulates water to let her swim in place. Her daughter Sydney, then 6, sat on the prototype, much as a seal might cling to a real buoy. It floated. Next she phoned a nearby wave pool, where people go to play in simulated waves. “Do you rent out your pool?” she said. “For how many people?” the attendant asked. The park donated two early mornings to her venture. Von Jouanne anchored the machine with ten 45-pound weights from a health club. It performed well in the playful waves, bobbing up and down without sinking. Then came the real test, at one of the longest wave simulators in North America. When von Jouanne first brought a buoy to test in the 342-foot-long concrete flume at Oregon State’s Hinsdale Wave Research Laboratory, “things didn’t go as planned,” says Dan Cox, the facility’s director, with a laugh. Von Jouanne and co-workers plopped the buoy in the 15-foot-deep channel and buffeted it with two-, three- and four-foot waves. The first five-foot wave tipped it over. Von Jouanne kept refining her buoys. A small group watched as a five-foot wave headed for one of her latest versions. As the buoy lifted with the surge, a 40-watt light bulb on top of it, powered by wave energy, lighted up. “We all cheered,” Cox recalls. Route 20 winds from Oregon State to the coast though cedar and fir trees, following the Yaquina River. Near the mouth of the river is a sandy spit with low buildings decorated with oyster shells and gnarly driftwood. Breezes set halyards from the nearby marina clanking against metal masts. This is the home of Oregon State’s Hatfield Marine Science Center, devoted to research about marine ecosystems and ocean energy. For instance, the buoys absorb energy from waves, reducing their size and power. Would shrunken swells affect sand movement and currents near shore, perhaps contributing to erosion? Buoys, as well as the power cables that would connect to the electrical grid on-shore, emit electromagnetic fields. And mooring cables would thrum in the currents, like a guitar string. 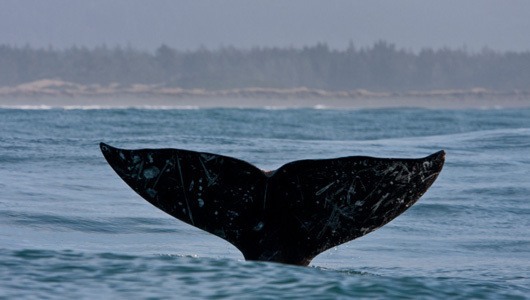 Might these disturbances confuse whales, sharks, dolphins, salmon, rays, crabs and other marine animals that use electromagnetism and sound for feeding, mating or navigation? Would birds collide with the buoys or turtles become entangled in the cables? Would anchors create artificial reefs that attract fish not normally found in that habitat? Would deploying, maintaining and removing buoys disturb the seafloor or otherwise change the ocean environment? “I want to know the answers to these questions, too,” von Jouanne says. “The last thing I want to do is harm the ocean and its beautiful creatures.” To study the environmental risks and allow wave energy engineers to test their inventions, she and colleagues at Oregon State, including Boehlert, are building a floating test berth nearby. It is scheduled to open next year and at its center will be a buoy full of instruments to collect data on how well wave energy converters are performing. The test berth is part of a massive effort to move wave energy out of the lab and onto the electrical power grid. Through a new Energy Department-funded national marine renewable energy center, researchers from all over the country will have the chance to refine their inventions in the WESRF energy lab, test them in the Hinsdale wave flume and perfect them in the ocean. “This is what we need to do to fully explore wave energy as part of a renewable energy portfolio, for the state, the nation and the world,” von Jouanne says. Von Jouanne recently towed her best-performing buoy—her 11th prototype—out through Yaquina Bay and one and a half miles offshore. The buoy, which resembles a giant yellow flying saucer with a black tube sticking through the middle, was anchored in 140 feet of water. For five days it rose and fell with swells and generated around 10 kilowatts of power. In the next two to three years, Columbia Power Technologies, a renewable energy company that has supported von Jouanne’s research, plans to install a buoy generating between 100 and 500 kilowatts of electricity in the test berth off the coast of Oregon. See video of the device here. Another of Von Jouanne’s inventions, the first of its kind, is a machine that tests wave energy converters without having to get them wet. A prototype buoy is secured inside a metal carriage that mimics the up-and-down motion of ocean waves. Electrical equipment monitors the power the buoy generates. The test bed looks like an elevator car in the middle of her lab. Wave energy researchers from other institutions will be welcome to use von Jouanne’s test bed, but at the moment, it holds one of her own energy-converter buoys. A student sitting at a nearby computer commands the device to simulate waves 1 meter high traveling 0.6 meters per second with 6-second intervals between wave peaks. “That’s a small summer wave,” von Jouanne says. The machine hums, lurches and heaves like an amusement park ride. As the buoy moves up and down, a gauge registers the juice it produces. The needle moves. One kilowatt, two, then three. “That’s enough to power two houses,” says von Jouanne.